Yikes, what a great economic development juggernaut. The World Dairy Expo wrapped up its most recent show this week in our regional ag capitol and my home town, Madison, WI. The World Dairy Expo is the international meeting place for the dairy industry. 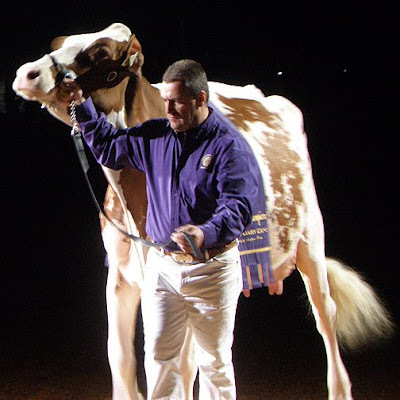 Expo offers the most elite combination of dairy cattle and exhibits in the world. More than 65,000 producers and industry enthusiasts from 90 countries attended the 44th annual event. Thank you everyone for your great work in dairy agriculture and your support of this great venue. This year’s vendors were outstanding. I got to visit with my friend, 2008 Organic Farmer of the Year Gary Zimmer of Otter Creek Farm in Iowa County, WI, who also operates Midwest Bio Ag, an international powerhouse in a biologically-based agricultural sales and consulting company. Thanks for a wonderful show and congratulations to all the great producers, vendors and the more than 65,000 ag supporters who made this year’s World Dairy Expo a great success.